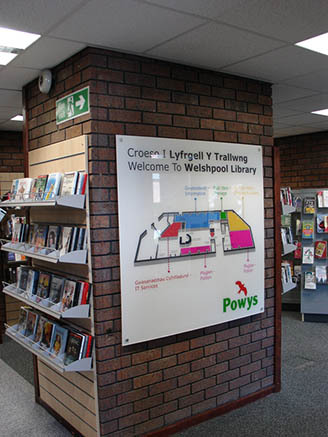 Welshpool Library is well located, purpose built and was opened in 1983. However, the internal appearance had become rather dated, and the internal design of the library was constrained by the site. 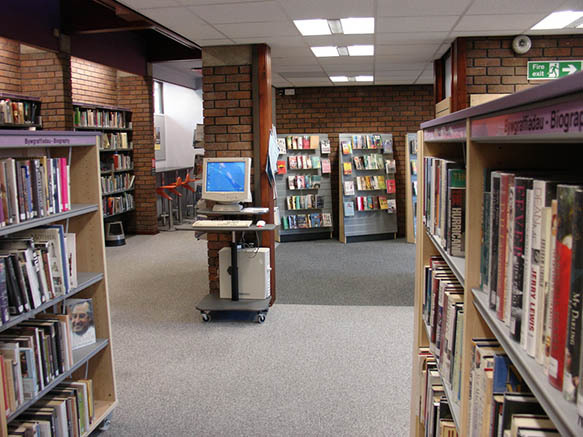 The structure of the building is in excellent condition, but the building's overall layout creates a challenging space from which to provide 21st century library services. The arrangement of services hampered development, and presented a regimented appearance with high density shelving, dark brickwork, low ceilings and poor lighting that created a rather gloomy and austere impression. 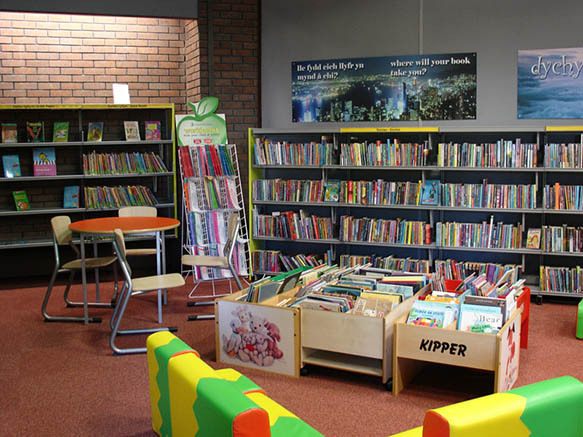 Powys Library Service was able to take advantage of the Welsh Assembly Government grant funding in order to enhance and improve the quality of the visitor experience particularly for parents and children, and to introduce new design ideas into the public area. 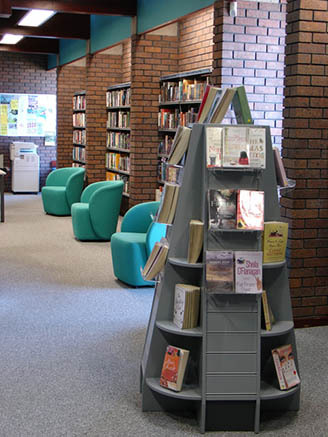 Although one of the county's busiest libraries, it has been less successful at attracting 'hard to reach' users who could have been put off by its rather austere image. Demco Interiors came up with a complete redesign of the public space within the building. 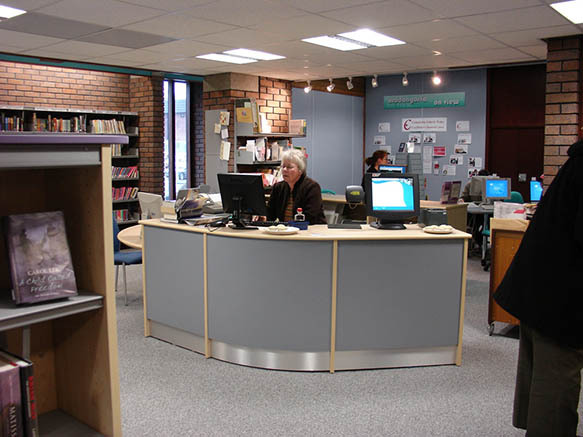 A new staff area was created in the now redundant store, and this allowed for a smaller counter/work area within the heart of the library, instead of immediately opposite the public entrance. 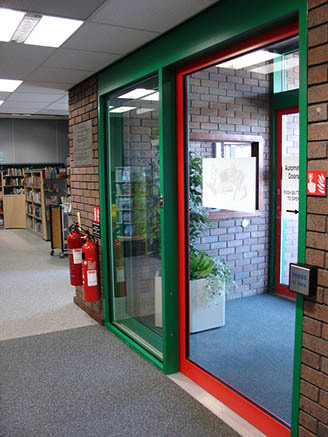 This in turn allowed us to provide a better, more welcoming entrance area, with glass automatic doors and a new window in the lobby wall to give visitors a view of the library's services as they come in. The transition zone comprises a high impact 'welcome' sign, and the Quick Choice and A/V stock presented face on. A 3M Self Issue unit was incorporated into the counter alongside face to face assistance so that the self service option has equal prominence, with staff on hand to help if necessary. The People's Network computers are now grouped together and allow for taster programmes and better supervision which was not previously possible when the pcs were scattered about the library. The library has long had a vibrant programme of exhibitions and the space has been re-sited and upgraded with a flexible hanging system. 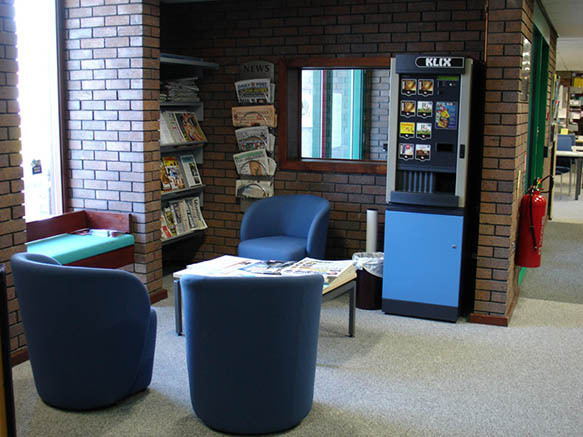 We created areas within the public space more attractive to people of all ages, providing them with a stimulating, attractive and safe environment in which to enjoy the services on offer, and to generally improve the ambiance with an informal seating area & coffee-vending machine. 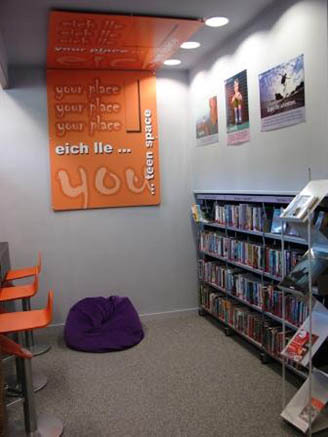 A 'difficult' corner has become a designated space for teenagers, and the children's library is now a clearly defined, colourful, flexible space in an area of the building that was previously under used. Improved lighting, a strong colour scheme for soft furnishings, wall coverings and carpets, and a design that has created space and views throughout the ground floor have had a dramatic impact on the environment. 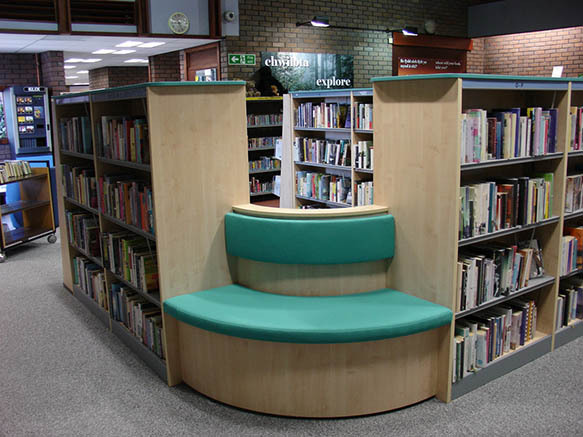 Low ceilings are now off white instead of dark wood, and natural Hessian wall coverings have been replaced with purple, turquoise and shades of grey, with colour coding reflected in the seating, shelf tops and guiding. An injection of new stock and extended access to local studies materials have helped offset a small reduction in stock levels. The high profile AV and Quick Choice sections have attracted increased borrowing, and general the reaction from the public has been tremendous.